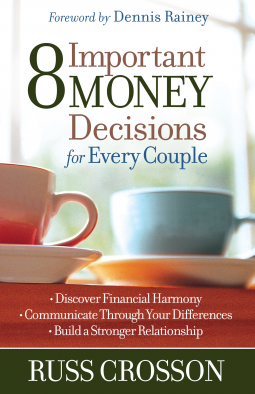 "8 Important Money Decisions for Every Couple" by Russ Crosson challenged my thoughts on money. President and CEO of Ronald Blue and Co. (a financial planning and investment firm), Russ Crosson uses a Biblical approach when it comes to money, saving, investing, and how a couple handles money can affect their marriage. After laying a foundation as to how we should look at money (as a tool, not as something that is going to solve all our problems and make us content), the book goes into common money decisions that are made in a marriage and how to avoid pitfalls. Whether you are single, dating, engaged, or have been married for some time, this book is an excellent tool! It challenges one to budget, save, and find contentment in a relationship with the Lord rather than in something temporary. One of the best things about the book is that, even though it challenges a couple to possibly do without, the Crosson's practice what they preach in their own marriage. From Capitol Hill to the small town of Moses Lake, Mallory Hale's life is turned upside down when she falls in love with a young researcher. Realizing that Daniel Webster Everson is her other half, Mallory marries him after just a month and moves to Texas, where he has accepted a job doing research for an eccentric millionaire. But all is not as it seems at Moses Lake, where cowboys and friendly neighbors have secrets. 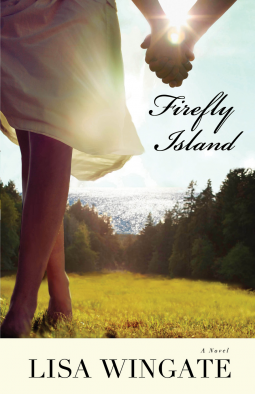 Can Mallory survive in a world so different from the one she was raised in? I loved this book! Its told in first person, as Mallory is looking back on events, so at times the story will skip over chunks or gloss over parts as someone writing from memory would do. It took me a bit to get into the story, but once I did, I was hooked! The characters are life like, going through struggles and making mistakes along the way, so one can relate to them. I found it easy to relate to Mallory, as she learned to navigate through working on an old house and being married after a life of independence. In "Unbreakable", readers can return to the small Mennonite community of Kingdom that was introduced in "Inescapable". This time, the small town is viewed through the eyes of Hope Kauffman, the gentle and kind hearted owner of the quilt shop in town. Life for Hope is predictable, she is engaged to her childhood friend, and leads a quiet life. When evil penetrates the town, targeting religious buildings and organizations with a raging hatred, the church elders and townspeople must choose for themselves if they are going to hold to their teachings of peace or pick up their guns and defend themselves. While I liked the first book in this series, I thought this one was even better! The story is riveting and there is a very real debate within the book about whether it is trusting God to pick up a weapon when you are threatened, a question every person must ask themselves. A while back, one of my friends came to visit me at market with an interesting challenge. "What if we would spend ten minutes a day praying for God's kingdom to come on earth? I tried to do it and had a hard time spending ten minutes just focused on praying for the Kingdom, so I spent the remaining time praising God." Have you every prayed for ten minutes about one topic? Can you be single minded for that long? She wasn't kidding, it's hard! I couldn't do it. So, I started praising God in the time that remained. You know what? It felt good to praise God. To think over those things that make Him omnipotent and all around wonderful. You know what else? It got me thinking "who am I?". Who am I, that the God of the universe would love me. I'm not a good friend to Him. I try to talk to Him a lot, but it's generally about things that I'm petitioning for. And yet, He loves me. And guess what? He loves you too. Praising Him doesn't change who He is, but it can change how we look at Him. If you were to praise God and think of three attributes of His that really blow you away, what would they be? I know Him to be a just and merciful judge. He is my strong tower when the world's storms batter me. But most of all, He is my Savior. He sees the lovable when I am being anything but lovable. He gently speaks to me when I am unreasonable. When I think about that, I feel humbled. So, this Thanksgiving, when you are thinking about all your blessings, take a second to praise God for what He is to you. Another winner from Krista McGee! Natalia Lopez shouldn't be surprised when her father announces that he is through with his third marriage, leaving with the shallow excuse that he has fallen out of love (again) and wasn't meant to be with just one woman for the rest of his life. In order to help her former step-mother, Natalia feels that God is leading her to move from Spain to Tampa to help Maureen recover, especially since she feels owes Maureen for leading her to the Lord. When they arrive in Florida, Natalia feels unprepared to deal with using English full time, transferring to a new school, and dealing with Maureen's bitterness. Thrown in to the mix is Brian Younger, the pastors son, who tries Natalia's desire to remain single so as not to pass on any of her family's dysfunction. Learning to lean on the Lord and turn her heart to want the things that God has for her may be the hardest lessons for Natalia. Loosely based on the story of Ruth in the Bible, I found this book a wonderful, entertaining read. Light hearted and warm, the story also has deeper messages about following God even when it isn't the plan we had in mind. I love that Krista McGee's books are sweet stories while talking about the importance of keeping a relationship Christ centered. Two thumbs up! Joy Christianson losses both of her best friends in one tragic night. Left to cope with the grief and feelings of betrayal, she turns to new friends to show her how to work through her heartbreak, little knowing that their path is one that is intertwined with the occult. Caught in a world she doesn't understand, and questioning the things that she has been taught at church, Joy wants someone to help her get out of the world she has created, but is afraid of the consequences to those she loves. In a desperate attempt for her parents to help, Joy is sent to Diamond Estate, a place for young women to re-connect with God and heal. Is it to late for Joy to find peace? This is the first book I have read by Nicole O'Dell and I have mixed feelings on how well I like her style of story telling. It might just be because I jumped in mi-series, but I felt like her story could of had more development. She did a wonderful job with writing about spiritual battles that go on around us, especially since I think we don't give enough thought to what goes on around us in the spiritual realm. "I was in the middle before I knew I had begun." 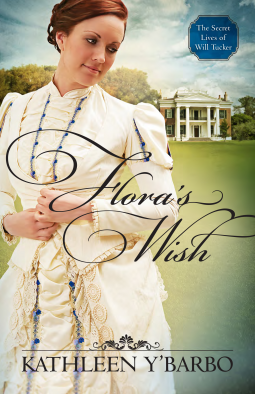 Flora Brimm can relate to the famous Pride and Prejudice quote, since she finds herself engaged for the fifth time to a man she hardly knows in an effort to save her family and their estate. After losing four fiances and being dubbed "Fatal Flora", she has decided the best way to make it to the altar is to jump right into being engaged. Unfortunately, she finds herself in the middle of a Pinkerton investigation regarding her fiance. Lucas McMinn has a personal reason to be part of the Tucker investigation. Deciding that Flora is his best bet to catching the man, he sets out on an unforgettable journey to bring justice. I liked the characters in this novel! I thought they were quirky and different, while being incredibly likeable. I thought the story was well written and there was plenty going on with both the main characters and well developed secondary characters. Two thumbs up! In "Lady of Bolton Hill" we were briefly introduced to Alexander Banebridge. "Against the Tide" goes on to tell what happened to the brass and brilliant trouble maker. On a mission to undo the mistakes of his past, Bane has been on a mission to bring down the opium trade by working with legislation to ban the use of opium in everything from children's medicine to headache syrups. Realizing that going through the government could take decades, he also works to shut down drug runners where he can. Lydia Pallas is a gifted translator who has been seeking for stability in her life. When Bane waltzes in with a innocent looking job translating menus and other random papers, Lydia jumps on the chance to earn more money to buy a home of her own. When things head south and they are both caught in a web of Bane's enemies, the two of them must form an unlikely partnership. 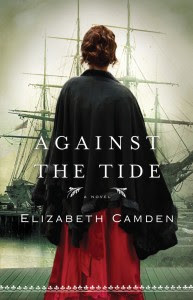 I love Elizabeth Camden's novels and this one may very well be her best yet! She does an incredible job with her characters in making them appear life like with realistic personality traits and faults. She also does a wonderful job with writing the message of salvation without coming across as pushy or trite. Two thumbs up! I do believe that this one will be the hardest one yet, since I always have a hard time limiting a list of favorite books. ;) I'm afraid I will be cheating a bit by using series.... lol. Originally published as Shadow of Colossus and recently edited to delight new and old fans alike, Isle of Shadows is from the Seven Wonders of the World series. Set in 227 BC, it follows the story of Tessa, a young woman who has it all from first appearance. The companion of one of the most powerful politicians in Colossus who furnishes her with every comfort, and yet not what Tessa most desires: her freedom. When events beyond her control transpire, Tessa must form an unlikely partnership with a spy and a Jewish servant to uncover a plot by a would be dictator. Is it possible that someone like Tessa could discover forgiveness and love? 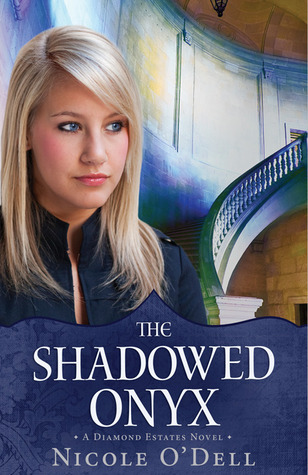 Isle of Shadows is an engaging novel for readers of all ages and back grounds. It will keep you on the edge of your seat!